The project team and staff will know what is going on and what is expected of them. This is possibly the most important aspect of any PM’s role – without this, there is a high potential for lack of leadership and the project failing. The bottom line: a project manager must monitor, maintain and know the overall and current state of the project budget, timescale, resources required and deliverables and produce the associated reporting to the project board. This is clearly a key aspect for any PM. 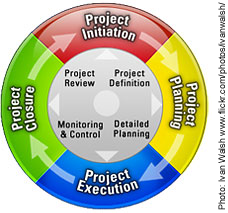 Maintaining an up-to-date project plan, including milestones. (NB: It is usually not sufficient to solely use a project plan provided by a software supplier as inevitably that does not incorporate all the internal needs and issues which the client has). Keep the project board up-to-date with monthly meetings and (usually) more regular highlight reports. A good PM can also work with the project board when it comes to discussing and making decisions on the project when it is not going as well as it should be. Co-ordination and centralisation. With a large project, it is imperative that everything is fed through a central resource and everyone knows how to do this. Monitoring resource allocation: Whilst the PM is not responsible for the actual resource allocation, it is important that they monitor how resources are being allocated and ensure that necessary resources have been planned for. Communication: not just with the project board and the immediate project team, but with the users and potentially a wider audience to keep all interested stakeholders up-to-date. Task dependencies: A key aspect of a project is that many tasks are dependent on other earlier tasks or must be started/completed before other tasks can happen. Again, this is something which needs to be monitored and understood. Risk assessment and issues management. This is a critical requirement and incorporates maintaining a risk register and issues log; and if it doesn’t go quite as far as being a ‘trouble-shooter’ then it certainly involves identifying and understanding the risks when trouble might appear. Okay, if you counted, then you will see there are 11 benefits – sorry, I just had to sneak them all in!